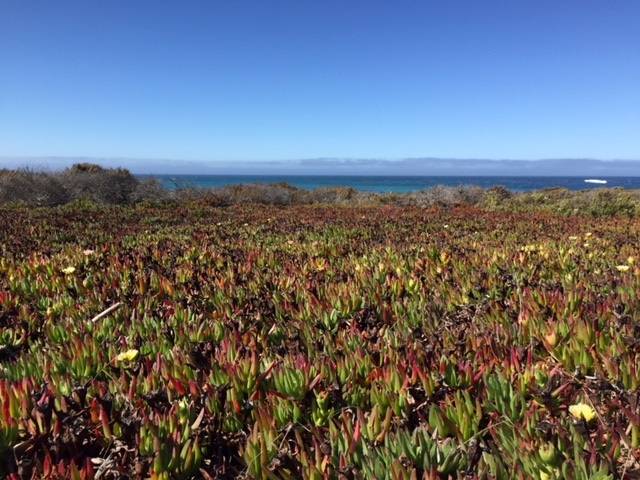 In a recent project, I am looking at population differentiation of 2 ice plant species (C. edulis and the less invasive C. chilensis) in 6 populations along California coast to first test if the populations of C. edulis indeed show differentiation and second to reveal species differences and hybridization patterns that might contribute to the more invasive nature of C. edulis. This will be achieved by setting up two common gardens in UC Reserves with the six populations of each species. I will be exploring the functional trait and gene expression variation among these six populations in an attempt to link the local environments to adaptions in these two species. Additionally, another ambition of mine is to conduct comparative studies with the South African, Mediterranean (mainly Turkish) and Californian ice plants to reveal continental patterns of adaptations. In order to achieve this, my goal is to start collaborative projects involving researchers from Turkey, California and South Africa to make use of similar climate histories and possible collaborative opportunities. This study will reveal the nature of strong environmental selection pressures that shape plant communities in these Mediterranean climates present in three continental locations and aid us to understand the genetic basis of invasiveness.